The Collective Obsessions Saga concludes with book eight, Megan's Legacy. Liam Larkin develops a new hotel and winery to attract tourists. He hires sommelier Petra Fortescue-Pemberton to organize local seminars and sophisticated wine-tasting parties, finding love where he least expects it. Other elements are at work to ensure the union never takes place, bringing another veil of evil over the Larkin's and their self-named city. Megan is forced to discover the truth and to set herself free from a legacy of family secrets and obsessions. 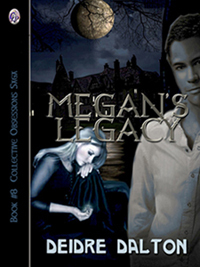 Megan's Legacy is the eighth and final book in the Collective Obsessions Saga. The novel was released by Club Lighthouse Publishing. Click here to read excerpts from Megan's Legacy.